Kuvichka and Kislytsyn prevailed in their semifinal encounter with Poland’s Adrian Sdebel and Piotr Ilewicz to make it to the gold medal match. The Russians lost the first set to the Polish at 21-17 and then fought hard to avoid elimination with a tight 21-19 win in the second set. By the third set, the Russian pair already mounted the big lead to complete the comeback at 15-8. 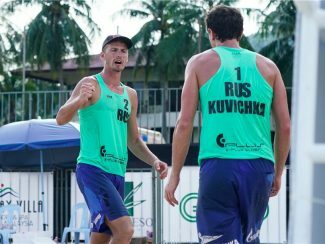 Facing their compatriots Bolgov and Ermilov at the final, Kuvichka and Kislytsyn dictated the tempo throughout the match, winning both sets (21-16, 21-15). 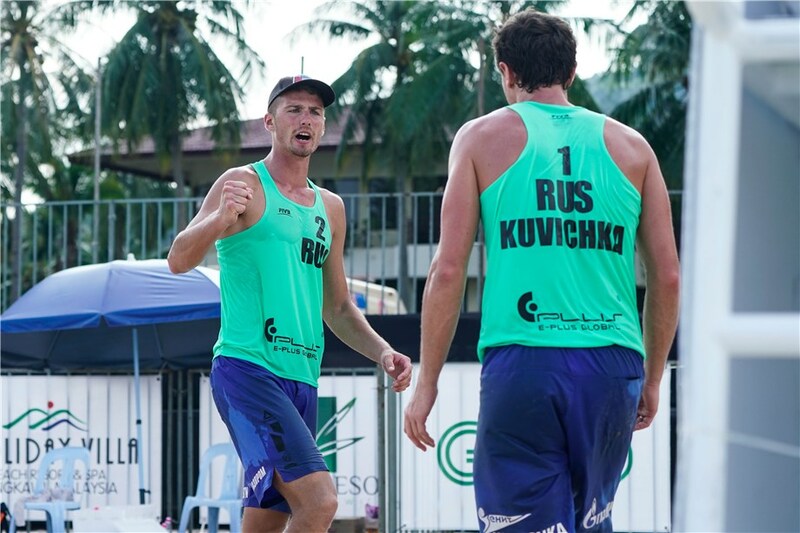 The Langkawi men’s final marks the second all-Russian men’s FIVB World Tour gold medal match. The first one was when Ilya Leshukov and Konstantin Semenov defeated Viacheslav Krasilnikov and Oleg Stoyanovskiy in three sets at the Yangzhou 4-star final on October 14, 2018. 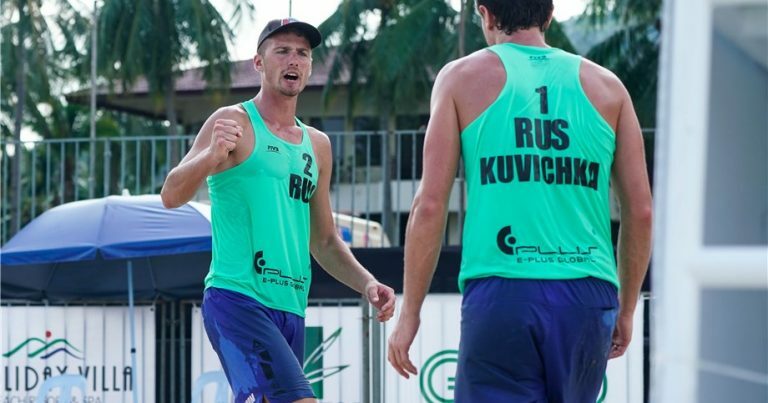 Kuvichka and Kislytsyn became the 25th men’s pair to capture an FIVB gold medal after qualifying for the main draw. This feat has now occurred 26 times with the Russian team of Taras Myskiv and Valeriy Samoday accomplishing the feat twice last season. 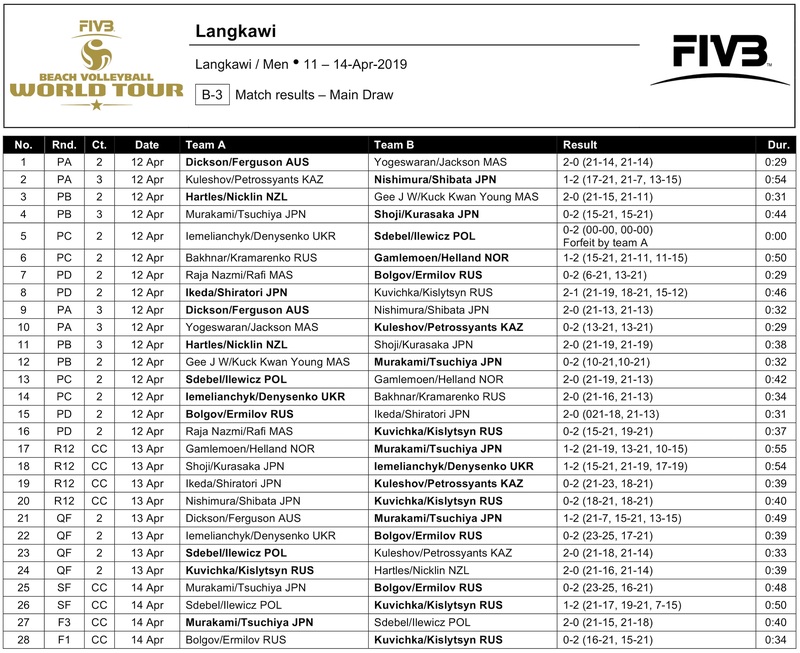 Japanese tandem Hitoshi Murakami and Takashi Tsuchiya salvaged the bronze medal with a straight-set (21-15, 21-18) win over Poland’s Sdebel and Ilewicz. The Japanese recovered from their 2-0 (25-23, 21-16) semifinal loss to Bolgov and Ermilov. Murakami and Tsuchiya are playing in their fourth FIVB World Tour tournament in their first season together. This is their second final four of 2019 and their first bronze medal after finishing fourth at the Visakhapatnam 1-star.